Coach Jason Crutchfield of FWC Berston Gym in Flint, Michigan roots from the stands of the Excel Center as his boxer Claressa “T-Rex” Shields wins the Gold medal in Female Boxing at the 2012 Olympic Games in London. 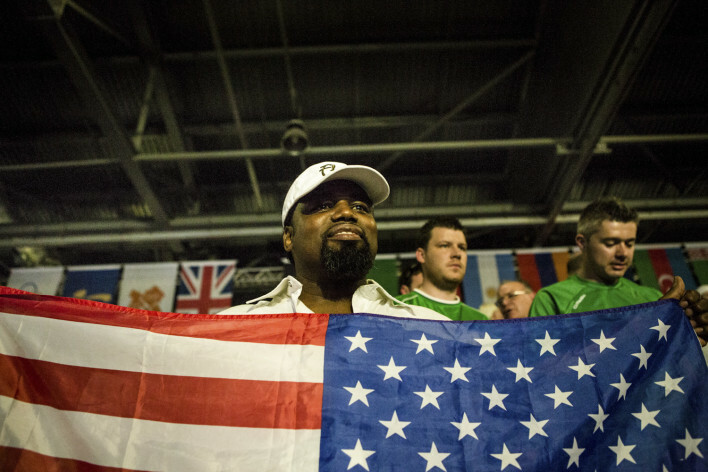 Although he has been her coach since she began boxing 6 years ago, he is not qulaified to be a member of the USA Boxing Coaching Staff so he must sit in the crowd with the fans. The 2012 Games were the first Olympics to include Women’s Boxing and Claressa is the youngest of the male or female boxers to compete.